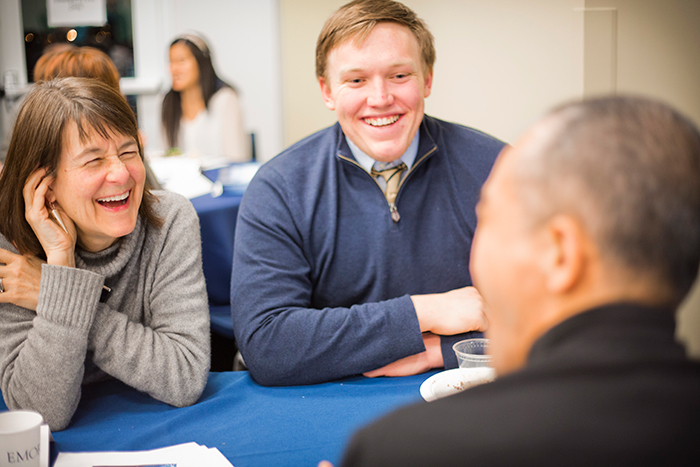 "CoLA Conversations: The Emory Story Project"
How can today’s students make the most of their liberal arts education, changing themselves and, possibly, the world? "Read a lot and behave badly," author Salman Rushdie quipped during a recent conversation hosted by the Coalition of the Liberal Arts (CoLA). Rushdie’s participation in the event was part of his annual extended visit to the Emory campus, his final such visit as University Distinguished Professor. Rushdie’s time on campus began with a Feb. 15 public lecture on "The Liberty Instinct" and also included a panel discussion on disability rights and human rights, as well as participation in several classes, before its conclusion Feb. 26. CoLA hosted Rushdie on Feb. 19 for an evening of informal commentary, part of "CoLA Conversations: The Emory Story Project." 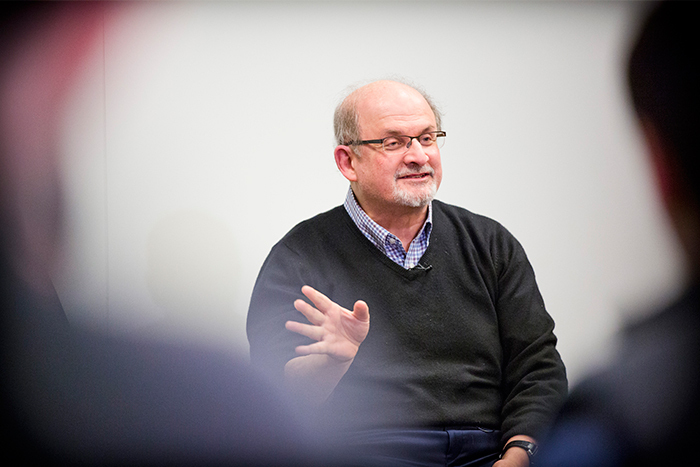 Co-sponsored by the Division of Campus Life, the event provided a first example of how CoLA hopes to extend the reach of major university events — in this case, Rushdie’s visit — into ongoing conversations for the campus community. "The CoLA Conversation Storytelling event was exactly what CoLA is hoping to facilitate," said CoLA Chair Robyn Fivish, associate vice provost of academic innovation and Samuel Candler Dobbs Professor of Psychology. "We brought together undergraduate students from the college and from Oxford with faculty from every school across the university and alumni to engage in a shared intellectual experience and significant meaningful conversations across these constituencies about the meaning of a liberal arts education." For an hour, Rushdie reflected on his early experiences as a student and author in response to questions from the audience of about 100 invited students, faculty and alumni. Frank and frequently funny, he told of grappling with his father’s wish that he would study economics at Cambridge rather than history, his participation in anti-war demonstrations during college, working in advertising while writing during his time off, the years it took for him to finally find success as a writer, and how "the fuel for literature is optimism." Rushdie admitted that he felt his generation was "lucky" in some ways compared to today’s college students, as they were galvanized by the Vietnam War and many also had the economic luxury to take time to pursue protests as well as intellectual interests they felt passionate about, without the fear of losing out on eventual careers. "I think the one thing that period of time gave those of us who were young then was the sense that by your direct action, you could affect the society in which you lived — that you could, in fact, change the world. "You didn’t have to wait for other people to do it for you, or just cross your fingers and hope. You could act and it could have an effect on society," Rushdie said. "And that sense of both individual and collective agency, I think was an enormously powerful gift that many of us have carried with us throughout our lives." Prior to Rushdie’s remarks, audience members shared dinner and began to get to know others at their tables, with seating assignments planned so that each table would include a mix of students, faculty and alumni. 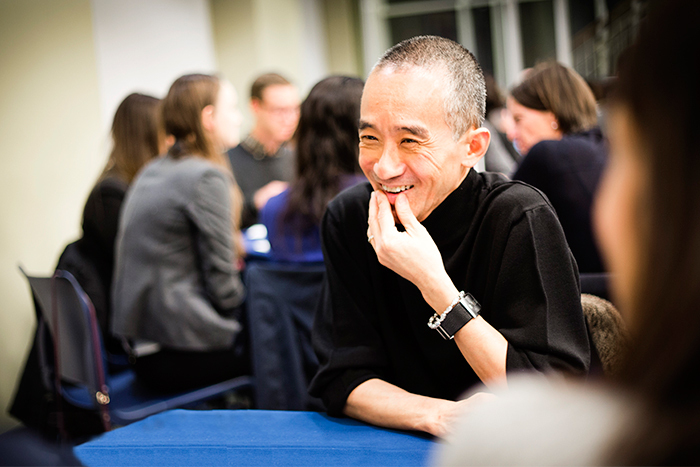 Following his discussion, the table conversations became more structured, as participants delved beyond small talk into "story circles" designed to create an environment of intentional listening. Each person seated at the table was asked to tell of a transformative experience related to the liberal arts. Stories were often deeply personal, forging a bond within the circle that organizers hope will last past the end of the event. "I had thought that talking with Mr. Rushdie would be the highlight of my evening, but I was wrong. 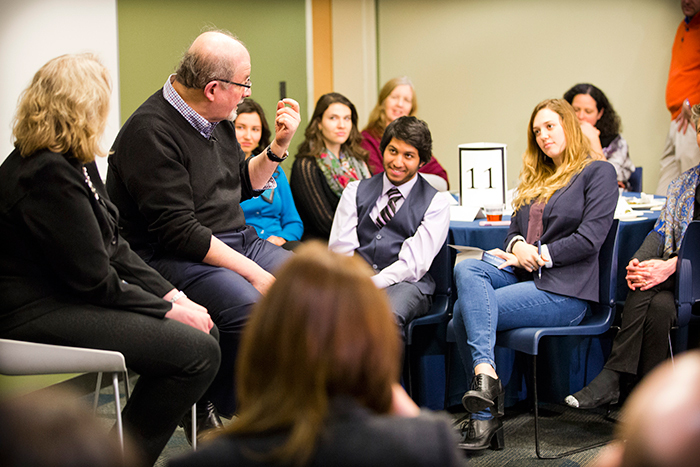 As charming as he was, the experience of engaging in a story circle with the undergraduate students was the best part of the evening for me," Fivush said. 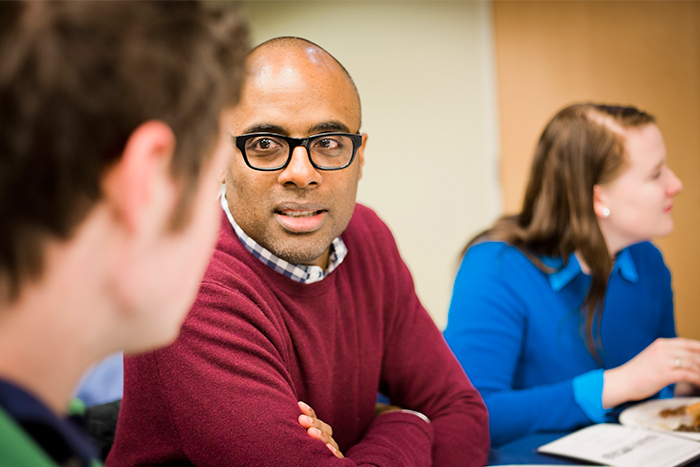 "I was so impressed by their thoughtfulness and their openness, and it meant so much for students, faculty and alumni to share their transformative liberal arts experiences." 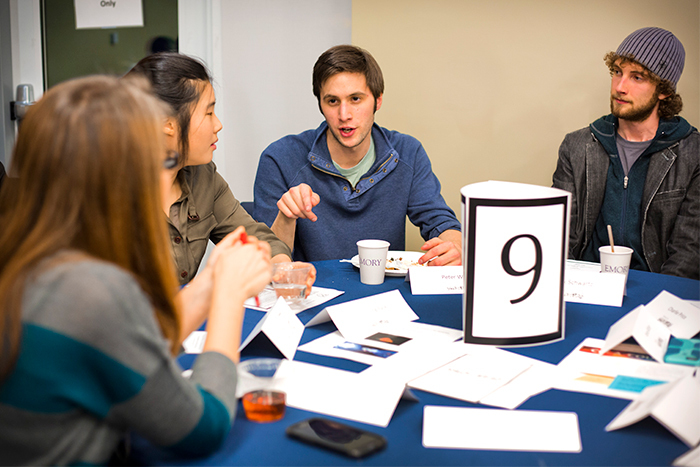 At one table, participants told stories about studying abroad, traveling to visit an ancestral home before leaving for college, the impact of mentoring from a fellow Emory student, participating in field work, and joining in a political protest for the first time. All spoke to the theme of finding your place, either at Emory, in a field of study, or in relation to family and the world. After the event, participant Aaron Stutz, an associate professor of anthropology at Emory’s Oxford College, said the evening "did honor to Emory's stated mission to support free inquiry and free exchange of ideas and stories." By bringing together a diverse group from across the university, "CoLA took an important step toward reinvigorating the way we create a community that can support and inspire all sorts of personal transformation, learning, and commitment to open-mindedness and creative inquiry," he added. Stutz agreed with Fivush that "the event’s real impact came from the story circle," and called every story he heard "impressive and profound." Still, he felt that the story prompt — to discuss a transformative event — didn’t really work in his personal reflection. Rather than a linear narrative of a particular incident, Stutz’s story centered on the visceral experience of participating in archaeological digs, as the analytical world of studying artifacts gives way to the very physical sensations of wielding a pick and feeling how it moves through dirt to find the treasures beneath. Yet while Stutz felt his story didn’t fit the mold for the evening, for participant Min-Young Park, a sophomore in Emory College majoring in International Studies and Arabic, Stutz's story made the most impact — an example of the differing effects stories can have on their listeners and tellers. "His story was just so tactile, so tangible, if stories can be that way. Although most stories tend to have lessons with them that are only known after looking in retrospect, his was about living and being in the moment, and what that's like as an archaeologist," she said. "I think it's rare to be so consciously aware of such thought in the moment versus in retrospect. It's living it frame by frame, and really appreciating it while you're doing it," she continued. "I hope to achieve that skill one day." During her turn, Park, a QuestBridge Scholar from Wisconsin, told of traveling to Korea with her family prior to leaving for Emory. There, she learned of her paternal grandfather’s difficult life and his wish that her parents would move to America so that the baby they were expecting — Park herself — could be raised with all the country has to offer. When she asked her father what she should learn from her grandfather’s wish for her, he told her that is what she was going to Emory to find out. Like Stutz, Park was excited to participate in the CoLA event, which she described as a "bucket list" experience as an Emory student. "Getting that close to an influential scholar while in a small one-to-one liberal arts setting — it’s something you could only get with Emory," she said.